The verb translated “fan into flame” in 2 Timothy 1:6 is unique in the Greek New Testament. The full phrase is somewhat startling as Paul calls Timothy “to fan into flame the gift of God.” One commentator suggests that “Timothy might be in a state of athumia [discouragement].” If so, is Paul anxious about the possibility of Timothy wilting in his ministry duties at Ephesus? Or, does Paul have something else in mind with these words? Let’s take a closer look at this phrase and see if we can discover what Paul is saying to his “beloved son” (1:2). The Context. There are three things in Paul’s letter that immediately suggest Timothy is doing well in ministry and that Paul is pleased with his son. First, Paul begins his letter by sharing his longing to see Timothy, “that I may be filled with joy” (1:4). Paul considers Timothy a genuine source of spiritual delight. Second, Paul writes that he knows that Timothy’s present faith is “sincere” and models that faith which “dwelt first in [his] grandmother Lois and in [his] mother Eunice” (1:5). Finally, at the end of the letter, Paul implores Timothy to “do your best to come to me soon” (4:9). Such a personal entreaty is not consistent with the view that Paul considered Timothy to be vacillating in his ministry and in need of verbal correction. Therefore, the context of the letter does not seem to be a Pauline frustration with a discouraged or retreating son; rather, it seems just the opposite. The Term. Mounce properly suggests that to understand this phrase one must begin with “a precise meaning” of the verb translated, “fan into flame” (475). He notes the verb is actually a present infinitive of continuous action, meaning, “to keep in full flame” (476). Rather than being a criticism of what Timothy is not doing, the verb is actually an encouragement to Timothy to continue what he is doing. Knight concurs that this verb is not used by Paul to mean that Timothy’s heart for ministry is dying, “but that he should fan into flame that special gift of God that he had received, i.e., make full use of it” (370). Chrysostom’s Implication. The phrase in full is, “fan into flame the gift of God.” Paul knew both the challenge of leading the ministry at Ephesus and the delicate constitution of his son Timothy. To encourage him in his pastoral role as he faced a number of trials (cf., 2:24-26), Paul encourages Timothy to make full use of the gift (charisma) that God gave him for this very purpose. Though this spiritual gift is not defined in this text, both Timothy and Paul knew what that gift was (cf., 1 Tim 4:14), how he received it (1:6b), and why it must now be exercised (1:7-14). The purpose then for Paul’s metaphorical expression was to encourage his son in the faith to a greater fervency in ministry. 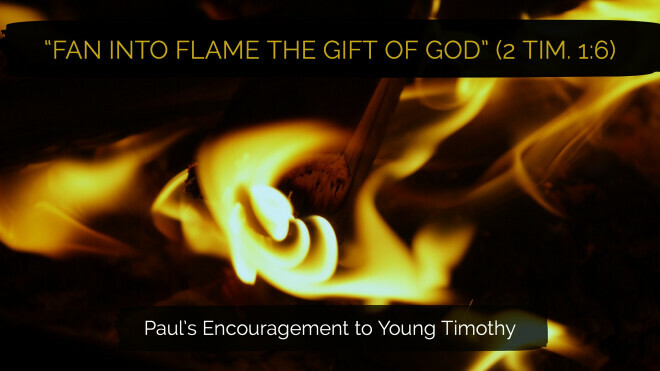 Centuries ago from this text Chrysostom observed, “A fire requires fuel, so grace requires our alacrity, that it may be ever fervent.” In sum, Paul’s words are meant to encourage Timothy to eagerly use his spiritual gift and keep his ministry fire burning brightly. A Personal Thought. As I contemplate this text, I am aware of a significant ministry tension: A belief that God has fully equipped me for ministry, and the reality that ministry can be difficult. May I (we) be eager to fan into flame the gift of God within us as we navigate through the challenges of ministry with a goal to exalt Jesus Christ!